What do they look like? What can I learn from them? Each pre-employment talent assessment interview measures a wide variety of “themes.” Each theme is a different aspect of a person’s personality and talent. Although all themes are helpful in determining “who someone is” and what type of employee a candidate might be, there are certain themes that are more important than others for each job in each industry. This is why we have different assessments for different roles. Our assessments can even be tailored to your specific company and role. You will receive separate assessment results for every person who takes the assessment. Each set of results will tell you how that individual scored in each specific area. 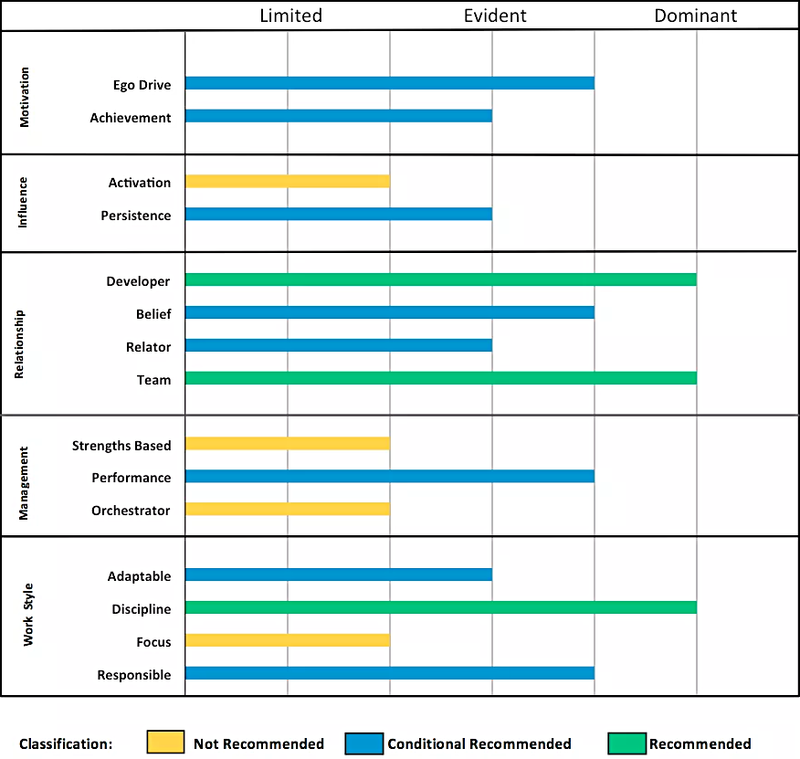 The theme definitions that accompany the results provide information to help managers understand their employees better, as well as some recommendations for managing each employee based on their results. The following samples will walk you through some example scenarios and how you would use the information to make hiring decisions. What is the most important thing to consider when hiring a sales person for my company? Our pre-employment talent assessment interviews for Sales Associates measure 13 different themes. However, there are 4 select themes that have been proven to be the most important to consider for this particular job role. Although all measured themes have their own importance in the role, when choosing between two candidates, these are the themes that can help you make that final decision. Consider the graph below. This individual obviously has quite a few strong talents. But, which talents matter most when it comes to a Sales position? If you knew that two of the top Sales themes are Courage and Interpersonal, you would know that this individual is a great candidate for your Sales position. Here is an example of some of the information you would get on one of these themes. Courage – Unwavering persistence and dedication to overcome resistance and make things happen. Courageous individuals display a temperament that enables them to stand firm in the face of opposition. Their fortitude allows them to take a stand, speak their mind freely and handle resistance from others without wavering. They can go against the popular opinion quite easily and defend their views when necessary. They can also be forceful to call others to action. People with high courage are not afraid to show their feelings no matter the intensity. 1. Can be firm and direct in their approach when dealing with others. 1. May employ a more passive or subtle approach when confronting others. 1. Likely to experience a degree of sensitivity when their views are questioned. 2. Are able to overcome resistance and will maintain assertiveness when being challenged. 2. May quickly acquiesce when confronted with opposition or resistance. 2. Being conflict averse, they will avoid challenging or confrontational situations. 3. Feelings are displayed openly and they not hesitant to make others aware of their opinions. 3. While they may make their views known, they may refrain from open displays of emotion. 3. Will conceal their true feelings and may change their views to align with group consensus. You will also receive some tips for managing someone with Above Average Courage as well as someone with Below Average Courage. This way, no matter who you select for your position, you have some insight into how to make them successful in their role. What should I look for when hiring a Manager for my department? Our pre-employment talent assessment interviews for Managers measure 15 different themes. However, there are 5 themes determined to provide the best indication of a candidate’s potential for success in a leadership role. 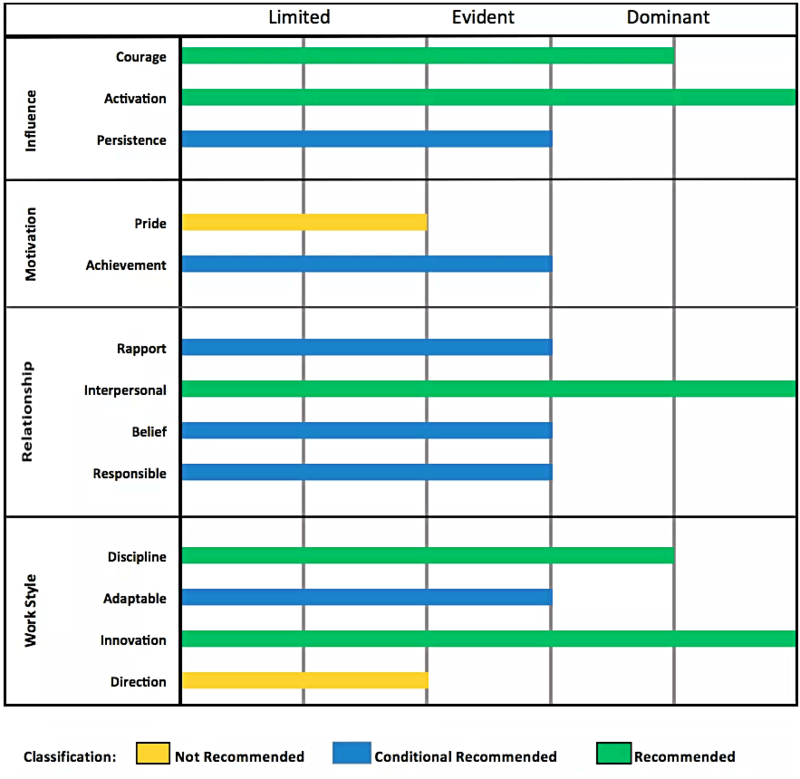 Although each and every theme in this assessment is important to review, those 5 themes are the ones that speak most to their natural leadership tendencies. Developer – Getting satisfaction from being involved in growth and development of others. Taking pleasure from the growth and success of people is oftentimes the hallmark of an outstanding manager. The best managers take great satisfaction when they can have a positive impact and see the incremental growth of each of their associates. To foster this growth, they will seek out and provide opportunities and situations that will enhance and advance the development of their people. They want to be the associate’s coach; a source they can use to become better at what they do. Finally, the best leaders have concern that enough developmental paths are open to their associates so each can chart their success and advancement within the organization. 1. Creates individualized strategies to provide support and foster development of people. 1. Recognizes and claims the value for training and development, but does not initiate the necessary actions to truly invest in people. 1. Displays no concern for active development and may hold the view that others are unable or unwilling to develop. 2. Sets up situations where others can coach, mentor, train, recognize and provide feedback to others. 2. Recognizes the successes and achievements of others. They show support toward others to develop themselves. 2. No developmental efforts or feedback are given. 3. Routinely delegates challenging responsibilities to foster learning and development. 3. Implements training to enhance skills and may provide some important projects to others. 3. Habitually restricts responsibilities, so development is lowered. Underperformance and mistakes are punished. The full results will contain information on all 15 Manager themes. They will contain the above information for each theme, but will also include how to manage someone with a high or low rating in each of these areas. This information takes you beyond the selection process and helps you manage them toward success once hired. Discover today what our strength-based assessments, trainings, and consulting can do for your company.